This unique how-to atlas presents in-depth, detailed, richly illustrated coverage of cosmetic surgical procedures that apply specifically to the Asian patient. Dr. Park, a pioneer in this field, along with Dr. Toriumi and a host of global experts present procedures for and pitfalls of cosmetic surgery in the Asian population. 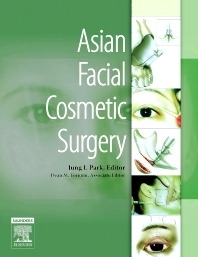 Inside, you'll find coverage of techniques not typically found in other Asian cosmetic surgery texts, including the single suture technique and the debulking technique for double eyelid surgery · anatomy for maxillofacial surgery · premaxillary reduction · and more. Discusses the anatomic differences between people of European descent and the Asian patient. Covers potential problems specific to Asian patients, including asymmetric eyelid creases · undesirably shaped eyelid crease · hollowness · "Westernization" · overly high eyelid crease · multiple creases · eyelid ptosis · scarring after epicanthal fold surgery · and more. LDetails the single suture technique and the debulking technique for double eyelid surgery · anatomy for maxillofacial surgery · premaxillary reduction · mandibulogram · aesthetic facial skeletal surgery · cheek dimple creation · mandible angle reduction · and Botox injection for masseteric hypertrophy. Uses 750 illustrations—most in full color—that depict every nuance of every procedure so you can quickly grasp each concept.